Home Guides How The Sun Affects Weather – The Basics? Today we’re going to be talking all about the Sun and how it Affects the weather here on Earth. The weather we try to capture with our weather instruments and predict. Obviously the Sun is important when it comes to a discussion of whether because the Sun determines whether if it will get hot or not. Well, that’s true but the our star is responsible for so much more. We like to say that the Sun is where it all begins because it drives every aspect of whether. Whether it be pressure distribution, the movement of air, the water cycle, the development of clouds, and rain. If it’s whether it was created some way or another by the Sun. The first thing that we need to talk about when discussing the sun and its relationship to weather is exactly the role that the Sun plays. How the Sun warms the air? Now we know that the Sun is this huge mass of energy and it’s constantly emitting that energy out into space. Some of that energy actually reaches the Earth and it reaches it through a transport means known as radiation. Now, there’s something that you need to understand about the incoming radiation from the Sun – our atmosphere doesn’t do a good job absorbing it. As a matter of fact incoming solar radiation that we refer to as shortwave radiation – which is visible light and primarily ultraviolet type radiation which can be dangerous – passes right through the atmosphere and it reaches the Earth’s surface. When the solar radiation is absorbed at the surface something very interesting happens, the Earth begins to heat up, so unlike the air that doesn’t absorb incoming solar radiation the Earth does, and one of the laws of radiation tells us that a good absorber is also a good emitter. 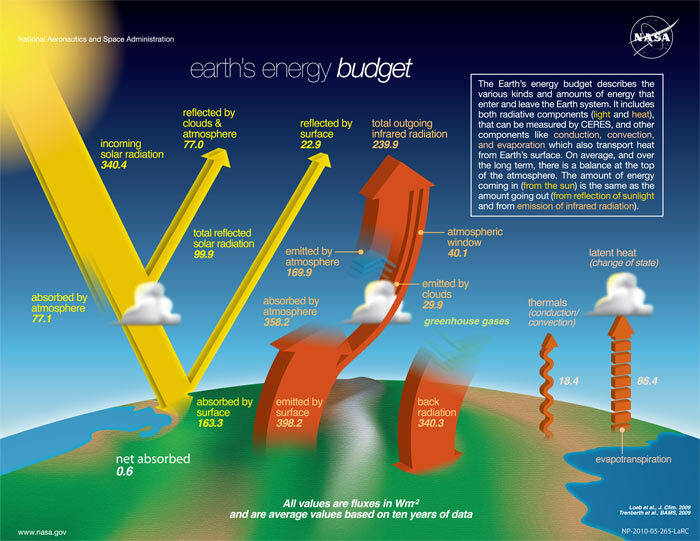 What happens is – the Earth turns around takes this heat energy and releases it in the form of long-wave radiation, most of which is sensible heat, known as infrared radiation. Than the atmosphere, the air around us, can absorb that radiation – the Sun heats the planet but it’s the planet that turns around and heats the air. This is precisely why the air closer to the Earth’s surface is typically a lot warmer than the air above us. It is because the heat source for our air actually comes from the Earth. Let’s take a closer look at incoming solar radiation and how it is actually received at the Earth’s surface. It turns out that the Sun is so immense large in comparison to the size of the Earth that incoming rays of solar radiation travel basically in parallel lines. But remember our home is not flat it is curved, so incoming solar radiation right in the middle of our planet, near the equator, is absorbed directly. However incoming solar radiation up towards the poles, at the northern or southern hemisphere comes in at an angle, a much lower angle. As a result less radiation is received. At the equator and near the center of the Earth the story is different – more incoming radiation means more heat energy for the atmosphere. However higher latitudes with lower incoming Sun angles – little cooler. Let’s take a closer look at this on the image bellow. We’re going to start off with the situation that would be the first day of spring or the first day of autumn. We refer to these as the equinox – that is when the Sun is directly over the equator and when the Sun is directly over the equator that’s the location where the incoming solar radiation is being received most vertical. With an angle of 90 degrees sun doesn’t get any higher than that. 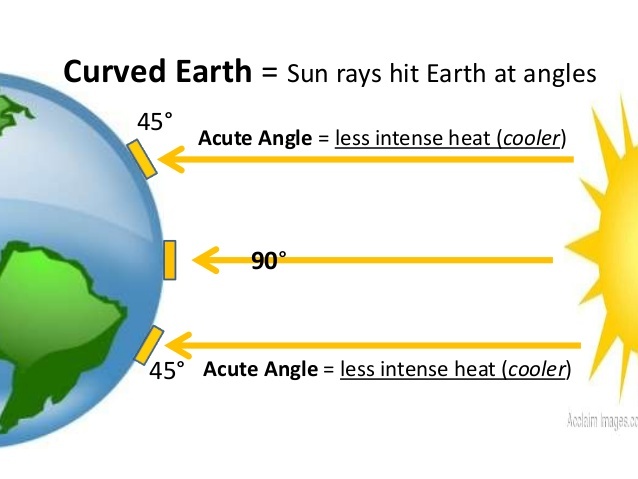 As you venture north or south of the Equator the incoming solar radiation comes in at increasingly lower angles, and remember lower Sun angles mean less energy received, which in turn means less energy to warm the air. All of this would seem to indicate that it’s always going to be hot at the equator and always going to be cold at the polls, because the equator gets the most son or at least the greatest sun angle. In general that is the case but you may have noticed that it isn’t always the same temperature all year round, things change. That’s because the home planet is tilted on its axis. The Earth’s axis of rotation is tilted at a 23.5 degrees slant, and what happens is, part of the year the northern hemisphere is actually facing the Sun receiving the greatest incoming solar radiation. That’s why in northern hemisphere its hot during summer, while in the southern hemisphere, where the Sun angles are much lower, it’s just the opposite, it’s wintertime. As we all know it’s not always summer and it’s not always winter, the seasons change. Basically what’s going to happen is – six months later the Earth is going to be tilted to the opposite direction in relation to the Sun, meaning that the southern hemisphere is getting the most direct incoming solar radiation. Before we go any further I don’t want to give you the misconception that that Earth’s tilt on its axis is actually wobbling towards t and away from the Sun. No, that’s not the case at all. It turns out that the our planet tilt on its axis is a constant, but its position in relation to the Sun is not. 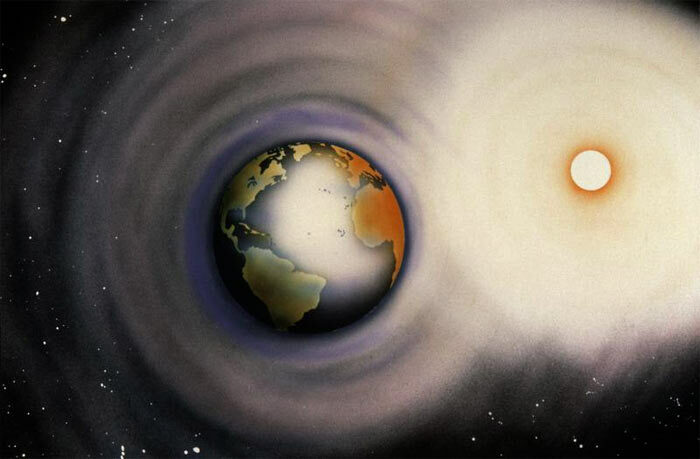 The Earth is on move the it is actually revolving around the Sun. It takes 365 days to make the entire journey. 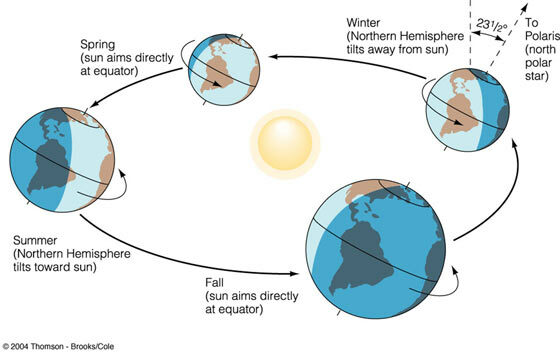 So this more or less this explains how we have our changes in seasons, because while the Earth’s northern hemisphere may be tilted away from the Sun on the first day of winter, as it makes its journey around the sun eventually on the other side the northern hemisphere is tilted towards the Sun. This cycle of seasons continues and this results in a constant changing of the way that the Earth’s surface is being heated by the Sun. The earth doesn’t heat the same all over. There’s changes in latitudes because of the curvature of the earth. But there’s more in to that. Believe it or not even areas that receive the same amount of incoming solar radiation could heat up differently. Let’s talk about the differential heating of land and water. To put this in perspective for you to imagine – we’re taking a walk out on the beach and as we’re walking across the sand the sand has been receiving the incoming solar radiation and gets hotter. Our feet are beginning to burn in the sand. What do we do, we rushed to the water to put our toes in the cool ocean and they are indeed become cooler because water doesn’t heat up as fast. Now if you’re doing the same thing at night you’re walking across the sand the you may feel kind of cold, because land also cools off faster than water does. Then you take your toes in the water and the water feels warm. … why does all of this uneven heating the Earth’s surface really matter other than for determining where it’s going to be hot and where it’s going to be cold. Well, as this map shows it affects so much more than that. This is pressure distribution around the earth. 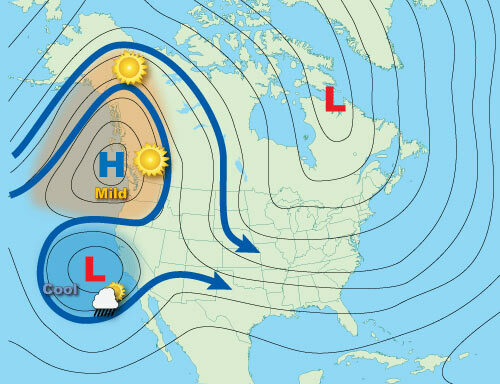 Notice there’s areas of high pressure (H) and low pressure (L), and while we won’t get into that here because that’s the topic of another whether discussion, we do want to note that uneven heating of the Earth’s surface leads to uneven pressure distribution. That too can be important because air moves from high to low pressure and when the air moves we call that wind . That’s why the Sun not only determines heat, it determines pressure and determines the movement of the wind. Hopefully by now you have a much better understanding of how the Sun affects and influences whether at the surface of the earth.